CONICET Researchers at Fundación Instituto Leloir proved that a plant photoreceptor also works a “thermometer” and influences the growth and development of plants. This could enhance crop productivity. Jorge Casal, Martina Legris and Cecilia Costigliolo. Photo: courtesy Fundación Instituto Leloir. “Light and hormone plant receptors have been identified, but scientists have never found unequivocally a temperature sensor”, Jorge Casal, CONICET senior researcher, affirms. He is the head of the Molecular Plant Physiology Laboratory at Fundación Instituto Leloir and the scientist who led the study published in Science journal. In the 1950s, Harry Borthwick, Sterling Hendricks and their collaborators at the Beltsville Agricultural Research Center in the USA, found that plants had different photoreceptors later called “phytochromes.” These molecules present in all plant organs parts, work as eyes that “inform” the plant about environmental light variations throughout the day and seasons. Now, Casal and his team unexpectedly found that a type of phytochrome (B) also records or “perceives” temperature. “This result is surprising because nobody would have expected to find that a photoreceptor, known for more than half a century, would also receive temperature”, the researcher indicates. It is like a light detector with a thermometer incorporated. “This sensor informs the plant whether it is cold or hot, during the day and in different seasons. With this information, different molecular reactions regulate the development and growth of the plant according to environmental conditions”, Casal, who is also the deputy director of the Agricultural Plant Physiology and Ecology Research Institute (IFEVA, CONICET-UBA), adds. For the scientist, this discovery lays the foundation for the future development of crops that can be adapted to different climate conditions. “Through the intervention of the molecular mechanisms that regulate temperature sensor, it would be possible to create tools to adjust certain crops to unusual temperatures for them. Thus, our study becomes relevant in the current context of climate change”, the researcher stated. How was this discovery made? Casal and his team identified the temperature receptor conducting experiments with plants of the Arabidopsis thaliana species, which share genetic characteristics with wheat, corn, potatoes and other key crops for global food security. 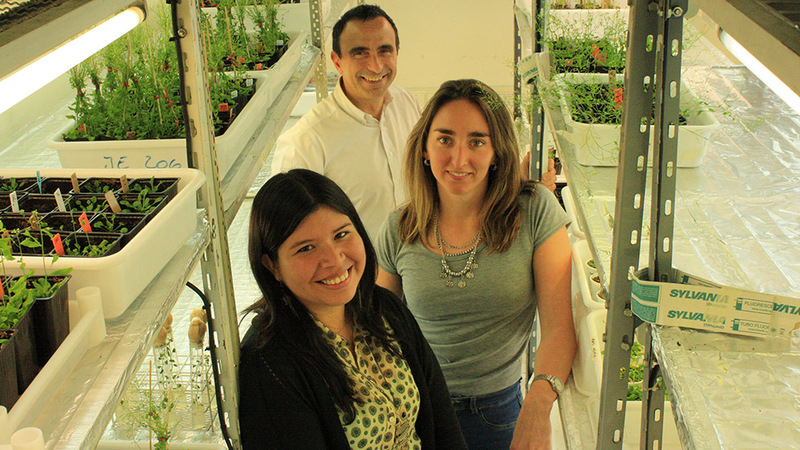 “However, to our surprise, we found that the phytochrome activity depends on both light and temperature conditions and communicates it to the plant”, described Casal, who received the George Forster Research award (given by the Alexander von Humboldt Foundation in Germany) for the relevance of his projects that are aimed at enhancing agricultural productivity. To provide that “weather report”, the phytochrome regulates gene transcription and protein abundance. In order to prove that the phytochrome B is also a temperature sensor, Casal and his colleagues studied it in vitro as an isolated molecule, then inside a plant cell, and lastly in plants subjected to light and temperature variations. “The in vitro studies allowed us to observe the structure of the phytochrome B at a molecular level and monitor its transformations as it was subjected simultaneously to light and temperature variations. We noticed that the molecule responds quickly and coordinately to both (light and temperature) signals”, Casal indicates. The following step was to see what happened at a cellular level in normal plants and others with genetic mutations whose receptors were sensitive to light, but not to temperature. It is a known fact that light variations modified phytochrome distribution in the cell nucleus. “Through the use of a confocal microscope, we observed that temperature also determined the concentration or distribution of phytochrome B in the cell nucleus. And the balance between temperature and light was what established that distribution”, the researcher describes. Lastly, Casal and his team carried out experiments to study the impact of environmental variations on the phytochrome function and the growth and development of the plants. For this reason, the scientists placed wild type and mutant plants (with phytochromes incapable of recording temperature) in cuvettes. The plants were tested through a spectrophotometer: an instrument to measure and record the physical and chemical changes of the phytochrome B in response to light and temperature. 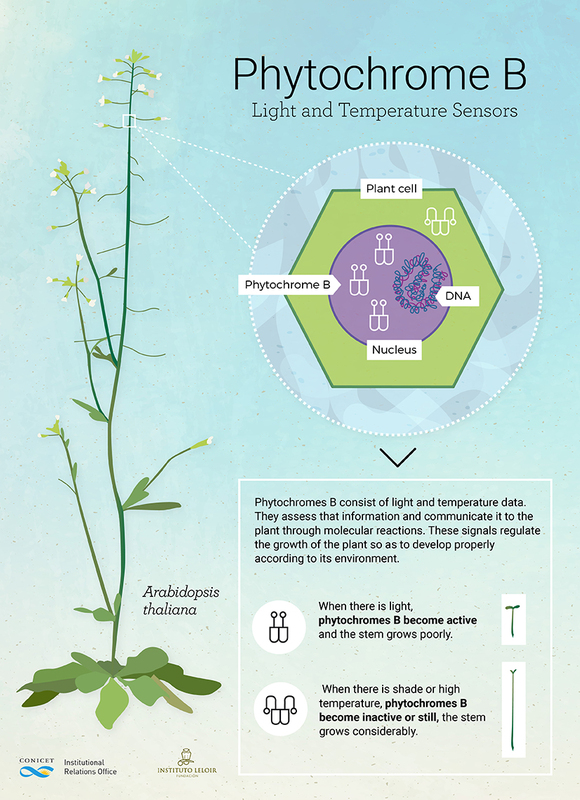 “The analysis showed that the phytochrome B also records and measures temperature, and makes a balance between that information and light conditions. That combined information makes the molecule turn into an active or inactive state. This is translated to the development and growth of the plants”, Casal states. The physiological variable that was analyzed was the growth of the stem. When there is light, the stem grows slightly; but with shade or high temperature, it grows much more. “Control of growth responses were attributed to the light regulated control of phytochrome B . But with our new study, we also show that the high temperatures remove the phytochrome’s active form promoting stem growth”, the scientist describes. The researchers also set up a database of information on the plants with normal and mutant phytochromes growing under different light conditions. “With this information, we developed a mathematical model that allowed us to predict plant growth considering the effect of temperaturte on phytochrome actividty or disregarding this effect. We concluded that it was important to take into account this effect in the growth of the vegetal models”, Casal, states and adds: “this development lays the foundations for the development of strategies that impact large-scale crop productivity. Considering climate change, this study allows us to know how plants obtain thermal data, and provides a tool to think about expanding the temperature range suitable for different crops. “We are currently studying different corn genotypes; then we are going to analyze their response combined with temperature and light connected with the genetic studies of phytochrome B”, Casal comments. “Food production should increase at a more rapid pace so as to satisfy the demand of a growing human population. We need to generate a second green revolution, and for this reason we carry out a joint work including scientists from different disciplines, molecular biologists, biotechnologists and agronomists, representatives of the production sector and decision makers”, Casal concludes. Other scientists who participated in the study were: Martina Legris, first author of the paper and CONICET doctoral fellow; Cecilia Costigliolo, doctoral fellow at the National Agency for Scientific and Technological Promotion; and engineer Maximiliano Neme. It is worth mentioning the collaboration of researchers from universities of Cambridge, UK, of Freiburg in Germany, and of Washington, in San Luis, USA.